Hunsberger Parents! Parent Social Planned for Feb 25! Hey there, all you Hunsberger Parents! Get ready for another Parent Social! 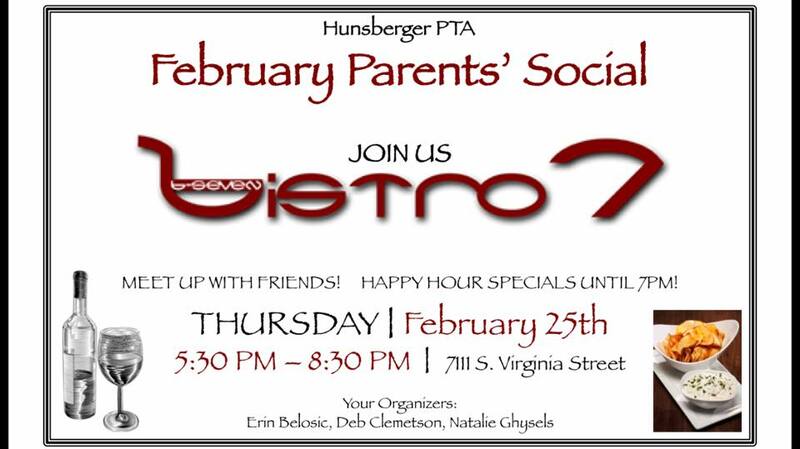 Join the fun on February 25th at Bistro 7 from 5:30-8:30pm. If you haven’t experienced a Parent Social yet this year, don’t miss out on this one! Grab some friends and join us for a fun evening! This entry was posted in ArrowCreek 411, ArrowCreek411, Hunsberger Elementary and tagged ArrowCreek 411, ArrowCreek411, Bistro 7, Hunsberger Elementary, Hunsberger PTA Parent Social, Ted Hunsberger Elementary. Bookmark the permalink.